3 Bedroom Semi Detached House For Sale in Nottingham for Guide Price £285,000. Guide price 285,000-300,000. A deceptively spacious three bedroom semi detached house. The current owner has modernised throughout to a very high standard. 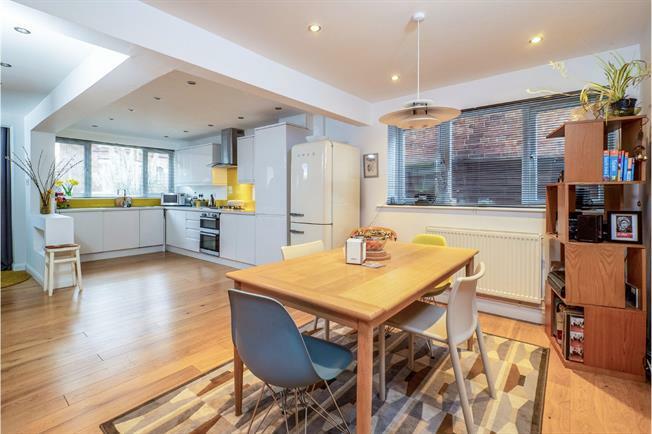 There is an open plan entrance into a large open plan kitchen diner leading through to the lounge with bi-fold doors overlooking the rear garden. Upstairs there are three bedrooms with the master being particularly large. A stunning four piece luxury bathroom with large double shower. The rear garden has a decked area, lawn and a brick built shed. The property has off road parking, gas heating and is double glazed. We highly recommend an internal inspection to appreciate what is on offer. Radiator, oak wood flooring, stairway to the first floor. Window to the front elevation, roll edge work surface, wall and base level units, stainless steel sink with drainer, electric double oven, gas hob, overhead extractor, integrated dishwasher, washing machine, open plan to the dining room. Window to the side elevation, radiator, oak wood flooring, under stairs storage. Bi-fold doors opening onto decking, radiator, electric wall mounted fire, oak wood flooring. Loft access, large sliding door wardrobe. Window to the rear elevation, radiator, full width sliding door wardrobes. Window to the side elevation, heated towel rail, tiled flooring, tiled walls. Low level WC, panelled bath, walk-in shower, wall-mounted sink. To the front there is off road parking. To the rear the garden is mainly laid to lawn with a brick built shed, tap, light and decking.